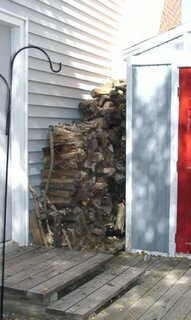 While my husband mowed the back yard yesterday, I finally got all of the firewood stacked up. Last year we had 2 piles, a small one in this spot, and another larger one along the side of the house. We decided that this spot is the better one when the weather (ie snow) comes because its easier to get to this.....decks are easier to shovel than dirt is if you don't want to be in snow over your shoes! And this morning, as if to make my point, its much colder out than yesterday.....ok, the next necessary project is cleaning the fireplace so we're ready for burning some of this.